Have you ever needed a little more time? We know that can be especially true around the holiday season. As Christmas gets a little closer we can’t make the clock roll back, but we can offer a little help with child care. Why not drop off your kids for a little fun and a review of the reason for the season – Jesus’ birth. Star of Bethlehem Lutheran Church is conveniently located just 8 miles from Hanes Mall. Christmas for Kids will be on Saturday 12/8. 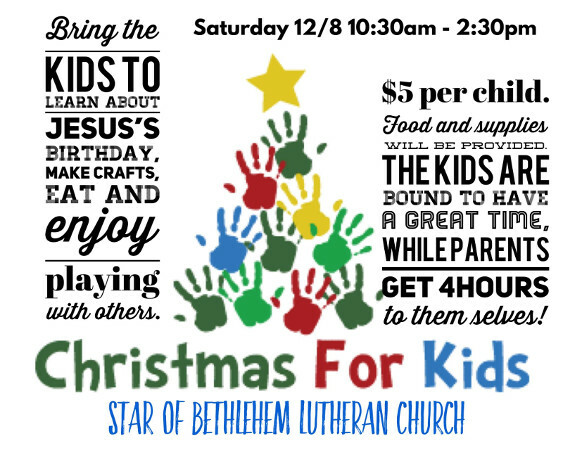 From 10:30 AM to 2:30 PM the kids will learn about Christmas through crafts, stories, songs and games and you will have four hours of free time to accomplish your goals. Reserve your spot today! Space is limited. A pizza lunch will be provided. The cost is $5 per child. There are no age restrictions. All are welcome to attend. Registration deadline is Wednesday, December 5.